I want to grow in my love for God and for others in 2018. How about you? Got any room to grow in love? It’s on my heart this year to give you at least one encouragement a month to live to love with Jesus. I don’t think we can hear it enough. In fact, if you know anyone who needs to grow in love (that would be everyone you know :-), please pass on the good words. Wouldn’t it be wonderful if the love of Jesus poured freely through us to those God puts in our paths each day? The first thing we notice in the verse above is that we are to imitate God. I think Paul was referring to Jesus Christ. Jesus was the beloved Son of God who walked in love. We are called to walk in love as Christ did, freely, willingly giving ourselves up to God and for others. We can’t imitate someone we don’t know. It is assumed that those to whom Paul wrote knew God because they had been loved by Him. I hope you know God's loves for you! How much does He love you? He loves you with the same love with which He loves His own Son, Jesus Christ.1 That’s awesomely stunning! His love is primarily seen and known in that He gave His life on the cross to atone for our sins so that we might die to ourselves and live in and through Him.2 Jesus Christ was God with us. He lived to love because He knew His Father, and His very nature is love.3 The Lord Jesus’ simple devotion to His Father, motivated by an incorruptible love, made Him a pure channel of God’s love to us. If you believe in Jesus, then you are a beloved child and therefore have a source from which love can flow from your life. Because we know God and have been loved, we too can walk in love. In fact, according to this verse, we have a mandate to walk in love. Loving God and others flows out of knowing God and being loved by Him.4 I like to think of it as a call to live to love with Jesus. This prayer has been a means of grace to me and perhaps it will be as well to you. I call this prayer the love seed. “Father, thank You for another day of life to live to know You and love with Jesus. Thank You for the people You place in my life today so that I might love You by loving them. Fill me with Your life and love today.” Then at the end of the day, I look back and pray for those He brought to me. I ask myself, “What did I give them?” Did I give a smile, a compliment, a helping hand, a listening ear, an open heart, or words of wisdom from God’s Word? If I didn’t, then I confess my selfishness and thank Him for His love and forgiveness. Would you consider asking God to help you pray this way every day this year?If you want to grow in love, then I suggest that you begin consistently to pray, seek His face and help, and be intentional about walking in love. 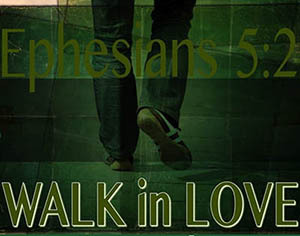 We are to walk in love just as Christ also loved us. Paul was specific as to what kind of love he had in mind. Jesus gave Himself up for us as an offering and sacrifice to God. Love flows out of His children who are filled from the inside out by the indwelling Jesus Christ. They are liberated from having to fill their tanks from anyone or anything outward, just as Jesus was. He always looked to His Father for everything in life –– that’s love for God. The same is true for us –– simple, single-hearted devotion to God where we look to Him as the source of our love is love for God. We walk in the same kind of love that God poured out on us –– giving up ourselves for the benefit and blessing of others. Where does that love come from? It comes from God as we pour ourselves out for others in His name and for His glory. It’s a love that gives instead of gets. A love that is heavenly, not earthly. A love that isn’t corrupted by selfishness. Let’s not miss that the reason for loving is to please God, our Father. The love of Jesus is a fragrant, pleasing aroma to God. 1John 17:23 I in them and You in Me, that they may be perfected in unity, so that the world may know that You sent Me, and loved them, even as You have loved Me. 2 2 Corinthians 5:14-15 For the love of Christ controls us, having concluded this, that one died for all, therefore all died; and He died for all, so that they who live might no longer live for themselves, but for Him who died and rose again on their behalf. 3 1 John 4:8 The one who does not love does not know God, for God is love. 4 1 John 4:7 Beloved, let us love one another, for love is from God; and everyone who loves is born of God and knows God. 1 John 1:19 We love, because He first loved us. 5 John 16:24 Until now you have asked for nothing in My name; ask and you will receive, so that your joy may be made full. John 15:11 “These things I have spoken to you so that My joy may be in you, and that your joy may be made full.